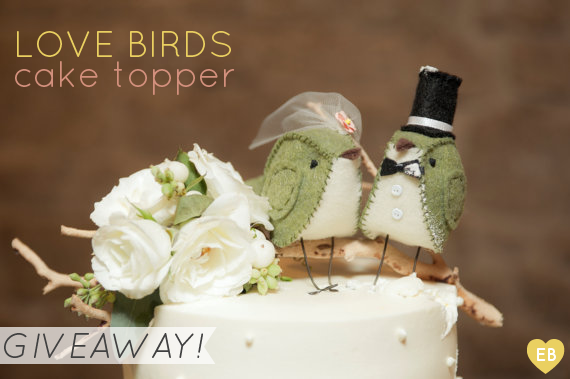 Home | Love Bird Cake Topper Giveaway! … Jenny B.! Congrats! Jenny, check your inbox for details. Thank you to CinnamonBirds for sponsorship! 1. Visit Cinnamon Birds + browse the entire collection. 2. Comment below on your favorite item from the shop! You may receive an additional entry by sharing this giveaway on Twitter PLUS another entry by sharing this giveaway on Facebook! Enter up to three (3) times per day using one method per day (comment, Twitter, and/or Facebook). One winner will be randomly selected using random.org on Monday, March 26th, 2012 and announced on our blog. Winner will receive moss birds shown above. Winner will be contacted via email. Giveaway open to US residents only; shipping to US will be covered by sponsor. You must be 18 years or older to enter. You may not enter more than three times per day. Previous giveaway winners within 30 days from winning date not eligible to win. No cash value. Custom made in green and white are too cute! Just adore the Pink Love Birds! The red love birds are so cute!! I love these “Love Bird” cake toppers…especially the one with the “baby bird”..so we can include our Son! Such cute cake toppers…really hope to win! i love the red ones, my colours are red =D thank you!! These are adorable!!! I have been looking for love birds to put on top of our cake because were doing a woodsy love birds theme!!! So cute!! My favorite are the green cake topper ones! The pink birds are so cute! I just love the apple green cake topper illustrated. I am icing a wedding cake for my daughter’s wedding in April and that is a perfect colour to go with the bridesmaids dresses. Beautiful….. I love the grey ones – they would go so well with our grey and yellow theme! Shared the giveaway today on my Facebook Page!! green and white might be my fave!! love it! The custom love birds are my favorite. These are absolutely adorable! These cake toppers are one of a kind and can give any cake that special touch! I adore the red birds. The little bride birdie with her blusher veil is SO. CUTE. Our colors are pink and green… loving those colors! I love the orchid pink birds! i SUPER love the red ones, and they suit my colours !! I would love to see more hoice on ther etsy site, and i would LOVE to win so so so so so so so much!!! <3 thank you! So adorable! Love the orchid pink set of lovebirds! 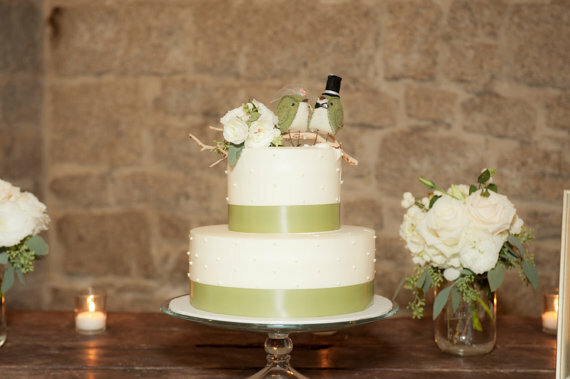 What a unique cake topper…I would have to choose the Apple Green Love Birds as my favorite :) Thank you for this wonderful opportunity! I love the moss birds. They would go perfectly with our purple and moss colored wedding theme! So adorable! Love the apple green lovebirds! love the orchid pink Love Birds, they’re so adorable! I like the custom love birds with the baby but I don’t have a kids. 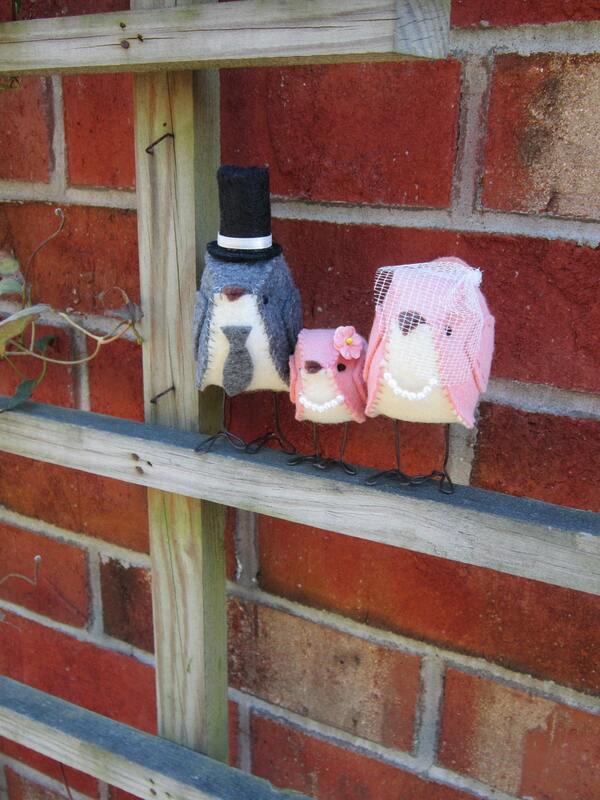 I love the all white bride bird and the grey color on the groom bird. Very cute. I love the Orchid Pink Birds – too cute!! My favorite are the ones shown for the give-away! They are so darling and perfect–love them. i love the custom love birds cake topper!! Pink and green! Yes, please! I love the orchid pink love birds cake topper. I’ve been eyeing them for awhile, but all of the birds are great! i LOVE THE BIRDS, BUT THE BLUE ARE MY FAVORITE. iT TAKES THE HAND AND EYE OF AN ARTIST…….. HOPE SHE LOVES MAKING THEM AS MUCH AS i LOVE LOOKING AT THEM. I absolutely love the Custom Love Birds Wedding Cake Topper with Baby! My Fiance & I have been together for almost 8yrs & we have a 3yr old Son! I have been trying to find unique ways to incorporate our Son into the wedding. I have found a couple things to do that would involve him, but I haven’t seen any cake toppers that are like this! That’s so cute! Also, I love the pretty green color of the giveaway cake topper…it would look so good with our Fall themed cake! The apple green love birds are precious! I’ve been looking for a cute bird cake topper…this would be perfect! The red love birds are my favorite. I love the grey colored love birds, but pink and green are also our colors! Very cute. The topper with the baby included. I really love the apple green love birds. The color of green used is perfect for summer or spring and the way the buttons with the bow tie on the little groom bird just makes it so cool. I also love the little bow on the veil. Perfect size on that.